This pretty 1 inch black, white and red pattern badge is perfect for any wedding. Every wedding needs a Best Woman! It is an important part of the day. 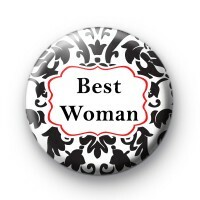 SO who is going to be your Best Woman, they 100% need this badge. Our Wedding badges are lovely keepsakes & we have them for the entire wedding party - so whether you are the Groom, Bride, Bridesmaid or even the Flower Girl we have a badge for you. These would even be fab on your Hen Party too!